FALCONA is a second-floor apartment (has stairs). It is perfect for one or two couples, or family with 2 children. Relax on the balcony rocking chairs and enjoy the magnificent view of the ocean and our colorful garden. Make yourself comfortable in the indoor living area and watch a good movie or sporting event on the flat screen TV. Many stations are in English. Enjoy the fully equipped kitchen that has a stove top and oven, plus a full-size refrigerator. FALCONA has two bedrooms and one bathroom. The Master bedroom holds a king bed. The second bedroom holds two twin beds that can be put together to make a queen. If requested a child’s cot or baby crib can be added. The price shown is for 2. There is an additional charge for extra guests. No pets please. MONTE PLACIDO is centrally located to explore the many pristine beaches of Samana. For most excursions, tour operators will conveniently pick you up after a short a walk down our hill at the main road intersection. 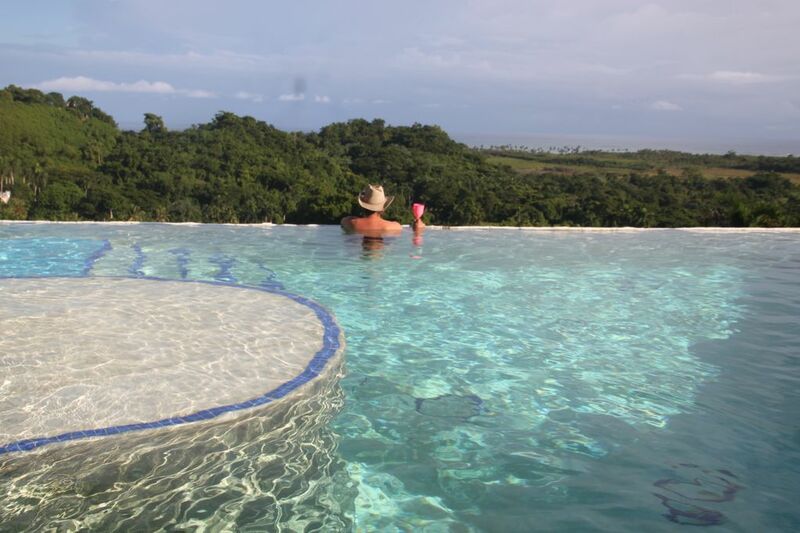 After a busy day adventure, return to our hilltop paradise and relax in the refreshing infinity pool. A favorite pastime is to hang on the edge where the water cascades and sip on a fine cool beverage. Fire up the poolside barbecue! Two separate poolside lounging, and dining areas offer privacy. Inside the pool, you will find a shallow area for children and a deep area for swimming. Shiva’s Cave Yoga Studio is on site. Experience this mystical, magical place with it’s interesting rock formations and special energy. The interior cave chamber is perfect for quiet meditation Look out over the ocean and enjoy your own personal workout on the large wooden deck. The studio can also be used for special events such as weddings, dance lessons and seminars. MONTE PLACIDO offers access to special services. Reserve a massage, which is a soothing indulgence to add to your day. Book an optional “welcome meal” to be ready for your travel weary arrival. Request a cook or chef during your stay. Ask for meals like pizza to be delivered. We can help you access activities you will not find through a tour operator like: hiking in the hills just behind MONTE PLACIDO , fishing with a local from our village , private yoga or belly dance lessons, or horseback riding just 5 minutes from us. Guests will also enjoy free membership at the Las Terrenas Beach and Sailing Club. We have lived in Las Terrenas since 2002 and are happy to share our helpful experiences and advise. At the same time, we know when to be hands off and we will respect your privacy. It is important to note that we live on-site. Our home has a reception area, so you will feel at ease stopping by to talk with us. In a rare occasion if we are not home, we have a caretaker and his family that also live on site. Jean Claude speaks Spanish and basic English. He is also available to help you. A very comprehensive “Guest Book” is in each home. There you will find many answers to frequently asked questions and information about excursions, shopping and bus schedules. MONTE PLACIDO is on a hill top overlooking the ocean. The residence is gated and safe. We always enjoy the nice cooling Trade Winds from the Atlantic and therefore have very few mosquitos. We are not ON the BEACH; however, we are centrally located to the many beaches in the area. Drive down our hill and you are in a typical Dominican Village. We love it because you get the feel of the local culture and charming, friendly people. An elementary school is in our neighborhood. If you feel inclined, they are so very happy to accept donations of easy reading books in Spanish or other school supplies. Rancho Playa is also in our neighborhood very close by. They offer horseback riding excursions up the mountains and to the beaches. A short walk down our hill to the main road you will find public transportation. A "Guagua" pick-up truck goes back and forth to Las Terrenas about every half hour dusk to dawn. Hop on and ride for about one dollar. We also have a trusted “moto-concho” driver. We can call him to bring you back and forth to town on his motorbike(s). Taxis are also available. In addition, we have a friend with a pick-up truck that you can reserve to take you to town and be your designated driver. At the same spot on the main road you can get a bus to and from Santo Domingo three times a day. It is an easy airport trip. Many of our guest take a short taxi ride form the airport in Santo Domingo to the bus station for TRANSPORTE LAS TERRENAS. The bus costs RD$400 (about $8 US) and will stop at our corner on the main road 3 times a day. We will be happy to meet the bus at Calle Luna and bring you up our hill. Although guests have been able to manage using only public transportation we recommend that you rent your own vehicle so that you are free to explore the Samana Peninsula. The main road system is safe and in good condition and a 4x4 or SUV is not required. We are environmentally friendly and all our hot water is generated with solar panels. We provide a one time set up of: 2 rolls of toilet paper, shampoo, soap. Towels changed every other day. Sheets changed once during a week stay. We provide beach towels. MONTE PLACIDO is a gated secure residence. Cook is available on request, massage & yoga on site. Sailing club membership. Nearby kite surf, hiking trails, bird watching. Located on a hilltop we are a short walk to the quaint Dominican Village below. Take a scenic stroll following a path into the hills to see local farmers at work. 180 degree panorama of the Atlantic Ocean. Never ending change of colors from dark blue to light green in the lagoons behind the reefs. listen to the rumbling of the waves over the reefs at night. Sheets changed once during a weeks stay. Including beach towels. Bath towels changed every other day. Our guests have free use of Shiva's Cave Yoga Studio. It is full stocked with mats, blocks, belts and an Iyengar rope wall. Stove top with 4 burners and oven. SKY TV. Many stations are in English. chess, checkers, scrabble, legos, dominos.. Living room open to a balcony where you can sit on rocking chairs and admire the spectacular ocean and garden view. Guests have discounted rates to rent at the Las Terrenas Sailing Club. As guests you are Members of sailing Club and preferred prices on sailboat and kayak rentals. Our pool area is spacious with two separate seating and dining areas for privacy. Barbecue by pool. Look up Monte Placido Vacation Home Rentals on the web and DOWNLOAD OUR DRIVING DIRECTIONS AND PICTURES. Do not depend on GPS in the Dominican Republic. Upon request we can have a meal waiting upon arrival so travel weary guest do not have to go back out again once they arrive. The meal needs to be reserved at least 24 hours in advance. Don and Diana go out of there way to make sure you feel comfortable, relaxed and welcomed at their "retreat" home. It is quiet (except for the wake up call from the roosters) and away from the busy city. But, it is close enough that if you need anything or want to get to the beach, it's only a 10-15 minute drive. I would recommend a car to provide flexibility, but the owners do give other options. We spent one entire day by the pool and enjoyed the view! I would highly recommend this place to the travelers that are looking for a true get away. Enjoy! Thank you Melanie, Yes, we are strategically located to reach all the pristine beaches of our area (not just one beach but many) and just the right distance from town to easily go shopping,dinning and yet just far enough be to away from the hustle bustle. The rooster issue that be annoying but his flock of hens do provide some fresh eggs everyday and nothing like an early rise to watch the sunrise from your terrace. We were looking for peace and quiet with tropical beauty and found it at Monte Placido. The driveway is a world class hill climb for a 3 cylinder car (splurge for a 4 cylinder!) but its necessary to have the stunning views we enjoyed. It was a nice luxury to have a whole casa to ourselves - the Falcone - and we would request it again for the vistas from the balcony. Don and Diana are responsive hosts who managed to provide a great experience despite the local electric power company going bankrupt, leaving a good chunk of Samana without power for weeks. They were getting solar quotes when we left! Looking froward to a longer stay next year. Thank you Bruce for sharing your experrience with other. Re Electricity. It should be noted that we have a back up[ generator just in case. Also last week, the local elect company is back up and running but we are still going solar next week. Coming up, true it is a little steep but as all our guests mention well worth the climb to and enjoy the vistas from our little mountain top gated residence comprised of 6 very private rental homes that can accommodate from 2 up to 12 guests. We can offer from a studio apartment to a 6 bedroom home. Don and Diana are amazing people. Very open and friendly. What a view! This place is idyllic, a set of whimsical mountain cottages set discreetly in a lovely, lively garden; birds and blooms and butterflies abound. The owners have taken great care to honor the natural features of the hilltop; each of the terraces has a unique view, and each makes the most of Samana's gorgeous light. The rooms are comfortable and well appointed; inside and outside spaces are equally inviting. Of special note is Shiva's Cave, an open yoga studio set into the hillside in what is still a natural cavern. This space, which can hold up to twenty-five practicing yoginis, is beautifully designed to allow a full view of the valley and the bay below. It's perfect for morning meditation, afternoon asanas, and sundown savasanas, a lovely spot from which to contemplate both earth and sky. If you are visiting the Dominican Republic with aspirations to rest and rejuvenate, Monte Placido is just the place for you. Top notch property with amazing views!!!! Everything about this location was amazing. The owners staff and everything I was able to do and experience on this trip to Monte Placido the best vacation I have taken in over 10 years. Would def go back. And I highly recommend this location for anyone no matter your past travel experiences. The area was completely safe and secure. One of the most beautiful location I've been to in the Dominican Republic. Such a review should help any potential traveler having any hesitations. Moreover, MONTE PLACIDO VACATION RENTALS is honored to hold by far the highest number (last count 62) of 5 star reviews in the Dominican Republic in our price category. Over the last 5 years Diana , I and our staff have worked hard to make our 6 rental homes and services on MONTE PLACIDO the most hospitable as possible. We are looking forward to welcoming you. One last note, we also have AIRBNB " Super Host Status. MONTE PLACIDO is on top a tall hill overlooking the ocean. We have a fantastic panoramic view with the ocean on one side and rolling hills on the other. As our guest, you will enjoy a membership to the Las Terrenas Sailing and Beach Club with chaises loungues, bar and restaurant and sail boat rentals. Las Terrenas is the up and coming small, trendy resort town in the Caribbean. (few all inclusive resorts here). Our little town is comprised of mostly small hotels/inns, residences and homes. Last count 5,000 foreign residents = 45 diff. nationalities thus restaurants/bars for all tastes and budgets. We are only five minutes to the beach, a 10 minute drive to Las Terrenas center - 40 minute from AZS El Catey-Samana Airport and 2h00 from SDQ Santo Domingo airports. For directions to reach our hill top ocean view paradise please contact us. Our residence is perfect for those who want to enjoy the nightlife and at the same time a tranquil tropical get-a-way.